Welcome to Cancun, upon your flight arrival IBMT Tours representative will welcome you at the airport and transfer you to your hotel in Cancun. After breakfast we will be departing from Cancun for Chicanná. 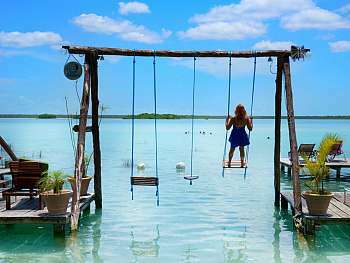 On route, stop at the Bacalar Lagoon, also known as the “Lagoon of the Seven Colors” thanks to its water that reflects several colors, such as turquoise and jade, throughout its 50-kilometer extension Lunch and continue to Chicanná, located in the amazing area of the Bec River, which received its name from the particular Mayan architecture style and where visitors can see recently discovered archaeological sites surrounded by an amazing Mayan jungle. Visit of Chicanná archaeological site, which means “House of the Serpent’s Mouth”. This site was only discovered in 1967 and stands out thanks to its doors marked with animal shaped masks; the Structure II is quite special due to its huge zoomorphic mask that probably represents Itzamná, God of the Sun. Arrival and check-in at the Eco Village Chicanná hotel. Accommodation. After a one-hour trip on the main highway, visitors will arrive at the drift that crosses the reserve of the country’s largest biosphere: Calakmul, which is the only real high jungle of the Yucatán peninsula. It hosts five of the six species of American wildcats as well as over 230 bird species and a great variety of flora. It is possible to see an incredible diversity of flora and fauna while traveling along this route. After one and a half-hour on a narrow road, you will arrive the Calakmul archaeological site, considered one of the most important sites, located approximately 25 kilometers from the border to Guatemala. 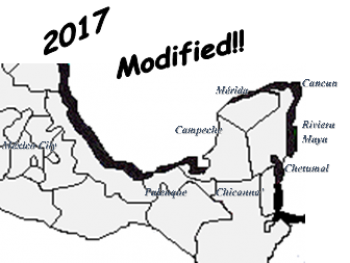 Hundreds of stelas (monoliths) surround this region, which clearly show its Mayan domain. 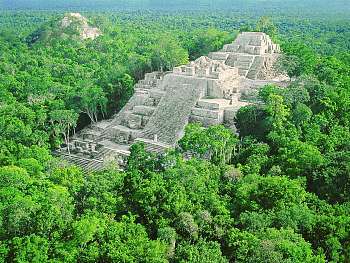 At the top of one of its largest monuments, visitors can admire the “green sea” of the huge Mayan biosphere. The visit ends with a break for packed lunch. Afterwards depart to Palenque. Arrival and check-in at Villa Mercedes Palenque hotel or similar. Overnight. Departure to Hacienda Sotuta de Peon, where you can see the transformation process of the henequen thread, Yucatan´s old green gold. Hacienda Sotuta de Peon was built in the late 19th century in Tecoh. 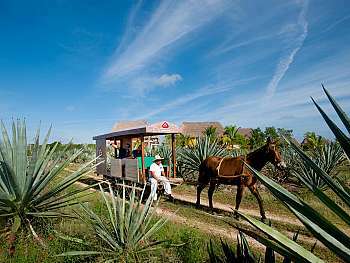 Walking through the Hacienda you will make a true journey back in time on board small wooden wagons named “Trucks” pulled by mules over old rails shipped from France in the late 19th century. At the end of the tour, submerge yourself in the crystal clear water of a wonderful Cenote on site. Lunch in the Hacienda. Return to Merida in the afternoon. Accommodation. Departure to visit Chichén Itzá archaeological site. Chichén Itzá was the Mayan capital of Yucatán and flourished between the 5th and 10th centuries AD. Visitors can admire the impressive buildings of the northern and central archaeological sites, such as: the Kukulcán Temple, the Ball Game, the Observatory, the Warrior’s Temple, the Convent of the Nuns and the Sacred Cenote. Lunch at Chichén Itzá in restaurant. After that, departure towards Cancún and Riviera Maya, where the tour will arrive after approximately 2 hours. Arrival and transfer to the chosen hotel. Good morning, it is time for you return with full of good memories of your beautiful tour vacation with us. Time to plan your next tour with us for any of our world wide tours. A transfer back to the airport will provided to you for your return flight back home.